2018 US Supreme Ct. L to R: Ginsburg (85), Kagan (58), Kennedy (82) (ret. 7/31/18), Alito (68), Roberts (63), Sotomayor (64), Thomas (70), Gorsush (50), Breyer (80). The most critical quality of a Supreme Court justice is his or her willingness to support all of the Constitution, not just the portions that suit his or her political objectives. 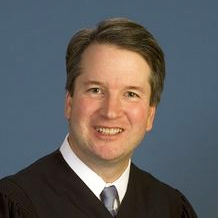 It is my understanding that Judge Brett M. Kavanaugh is on the record as stating that he feels that sitting presidents should not be subject to investigations. However, the Constitution includes the ability of the House to impeach the president and the Senate to try the president on those charges. But how could an impeachment and trial be done without an investigation to ascertain the facts? Any such impeachment and trial without an investigation of facts would be nothing more than a partisan "kangaroo court" or a "witch hunt" (whichever term you prefer). Consistent opposition to granting relief in capital punishment cases -- but opposition to physician-assisted suicide, which is premised on the sanctity of life. Has "originalist" philosophy of constitutional interpretation. "Judge Gorsuch's record reveals a consistent opposition to granting relief in capital punishment cases. This is, at some level, difficult to square with his forcefully articulated legal arguments in opposition to physician-assisted suicide, which is premised on the sanctity of life. His record on other criminal justice issues is more mixed. In cases dealing with policing-including Fourth Amendment challenges to traffic stops and excessive force —Judge Gorsuch sets a high bar for claims of racial discrimination, and often grants qualified immunity to police officers when they are sued for violating constitutional rights. In these cases, Judge Gorsuch brings a perspective that places a greater emphasis on deference to and concern for law enforcement than on inequities in our criminal justice system. However, Judge Gorsuch has ruled more favorably to criminal defendants on sentencing issues, where in multiple cases he has resolved statutory ambiguity—sometimes over dissent—to rule in favor of a more lenient sentence." Who's come out against Gorsuch? In TransAm Trucking, Inc. v. Administrative Review Board, the majority held that a trucking company unlawfully fired an employee in violation of federal whistleblower protections. The employee, Alphonse Maddin, was a truck driver whose brakes broke down in the middle of a freezing January night in Illinois. The truck heater didn’t work either, and he got so cold that he couldn’t feel his feet or torso, and he had trouble breathing. Nonetheless, his boss ordered him to wait in the truck until a repairperson arrived. After waiting for three hours, Mr. Maddin finally drove off in the truck and left the trailer behind, in search of assistance. His employer fired him a week later for violating company policy by abandoning his load while under dispatch. The panel majority said the firing was unlawful, but Judge Gorsuch dissented and said the employee should have followed orders even at the risk of serious injury. In Thompson R2-J School District v. Luke P., [Gorsuch] held that a student with autism did not have a right under the IDEA to attend a private residential program, even though the district court and a Colorado Department of Education hearing officer determined that such a placement was necessary for Luke and that public schools had been unsuccessful in addressing his educational needs. 1. 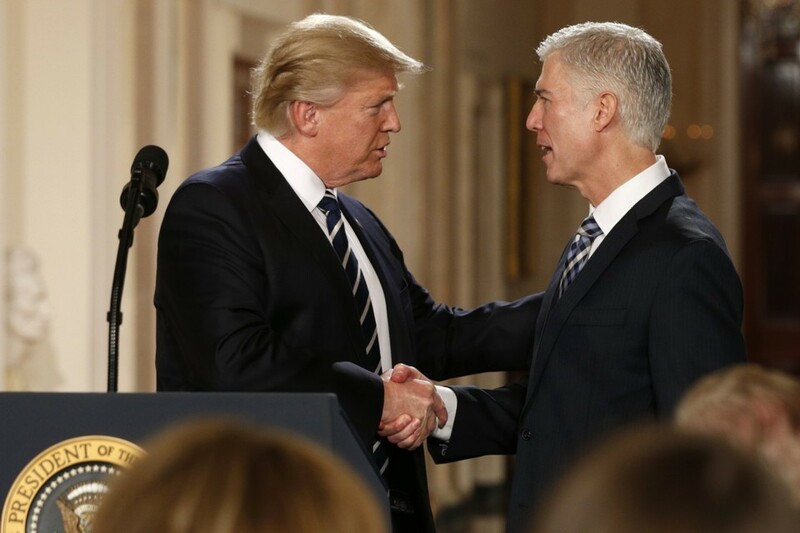 Trump and Republicans face a fresh test to shape Supreme Court, assert their power with Gorsuch hearings, By Ed O'Keefe and Robert Barnes, Washington Post, March 19. 2. Newly Public Emails Hint at Gorsuch’s View of Presidential Power, Charlie Savage, NY Times, March 18, 2017. 3. Trump Nominates Neil Gorsuch for the U.S. Supreme Court, MATT FORD, The Atlantic, JAN 31, 2017. 4. Neil Gorsuch Has Web of Ties to Secretive Billionaire, CHARLIE SAVAGE and JULIE TURKEWITZ, NY Times, MARCH 14, 2017. 5. The Civil Rights Record Of Judge Neil M. Gorsuch, A Report By The NAACP Legal Defense And Educational Fund, Inc., March 16, 2017. 6. Civil and Human Rights Organizations Oppose Confirmation of Judge Gorsuch to Supreme Court, The Leadership Conference on Civil and Human Rights, Advocacy Letter to Chairman Grassley and Ranking Member Feinstein, March 17, 2017.